One Bar per Order. Three Bars would complete 3-Way Down Guy. Modifies a GA45GD into a Torque Stabilizer Assembly that could be installed at existing Guy attachments on any horizontal brace as opposed to tower section joints. This Item will also require the 3/8 inch shackles to complete the upgrade. This Anti-twist device would be located in the area of the Microwave or other Focused Beam antennas to provide resistance to torque. Use only 3/16 inch Strand for Down Guy to this attachment! 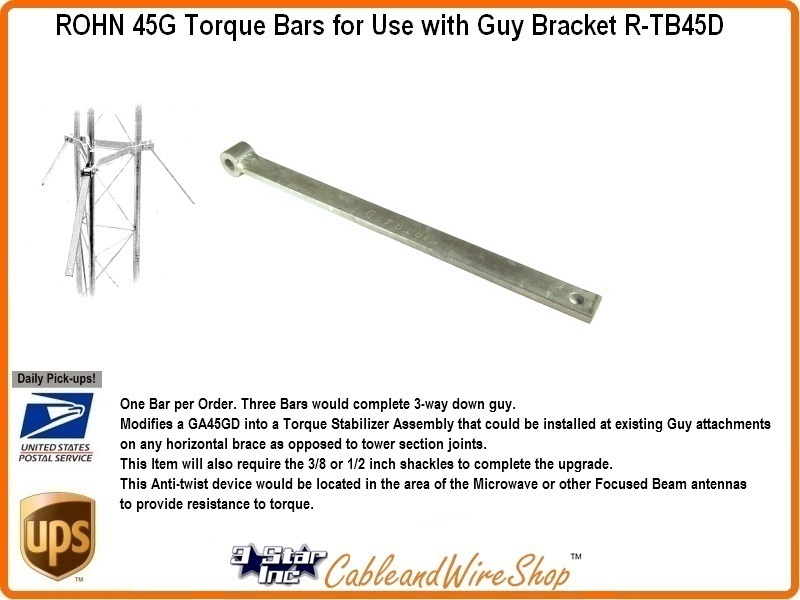 Note: ROHN TB45D is an upgrade attachment option for the GA45GD, when completed with 3/8 inch shackles. for a complete Torque Arm Stabilizer assembly, refer to the TA45, also sold here. American Steel. Buy ROHN, Buy American. These are the 3/8" shackles specified for use with the Torque Bar Options incorporated into GA35GD, GA45GD and GA55GD Guy Bracket Assemblies (use one for each Torque Bar, three each for a complete level).